Sgt. Hanson was on his second deployment with the National Guard. About two years ago he served a tour in Bosnia. Hanson's parents and brother attended a press conference at the Detroit Lakes armory Friday afternoon. Although they didn't make any public comments, they did issue a statement. "Josh was a wonderful and loving son and a great friend. He was proud to serve his country as duty called. We can't express enough how proud we are that he was willing to lay down his life for all of us. He and his comrades are real heroes." Lt. Col. Paul Zimmerman spoke from Iraq. He called Josh Hanson's death a tragedy for the National Guard, the state of Minnesota, and most of all Hanson's family. Josh was proud to serve his country as duty called. We can't express enough how proud we are that he was willing to lay down his life for all of us. He and his comrades are real heroes. "It is hard as a commander to lose one of our soldiers, and Sgt. Hanson was one of our brothers here in Iraq," Zimmerman said. 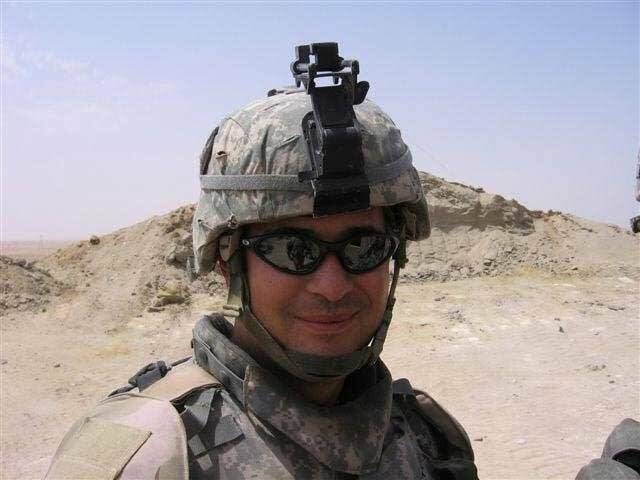 "I would like to wish his family, from all of us here in Iraq, that you are in our thoughts and prayers every day." Zimmerman says six other soldiers from the Detroit Lakes and Bemidji areas suffered burns when they tried to rescue Sgt. Hanson from the blazing humvee. All six are expected to recover fully and return to duty. A few local residents gathered in somber knots in the armory, listening to the news conference. One of them was Dave Knopf. His son served with Sgt. Hanson and was injured in the incident which killed Hanson. Knopf describes Hanson as a great young man. "Nice quiet, soft-spoken, not outgoing," Knopf said. "But I'm sure he was very determined, and he was there to do his job. The last time I saw him I gave him a hug, so that was the last time I'll have that opportunity." Knopf says Hanson's death affects the entire community, because nearly everyone knows someone who's serving in Iraq. Jessica Fahje is a high school classmate and lifelong friend of Josh Hanson. She says she last saw Hanson around Christmas at a going-away party. Fahje says she kept in e-mail contact with him in Iraq, and says he constantly told her not to worry about him. "We were going to see him in October. He was going to come home for a little leave," Fahje said. "We were going to plan a little hayride for him and get all the classmates together, but we're going to be getting together for a different reason now. " Fahje says she has no doubt Hanson died doing what he wanted to do. Josh Hanson had a degree in law enforcement, and planned to become a sheriff's deputy when his tour in Iraq was completed. More than 40 members of the military with ties to Minnesota have been killed in the war in Iraq.